A recent Google advertisement called “Google Search: Reunion,” starts with an Indian grandfather waxing nostalgic about the days before India and Pakistan were separate countries. His granddaughter addresses him by the Hindi word for grandfather, “daadu,” a sign that they formally belong to the Hindu faith. The grandfather reminisces about his childhood days with his Muslim friend, Yusuf, now a citizen of Pakistan. The advertisement then shows the granddaughter doing several Google searches including search phrases like “park with ancient gate in Lahore,” “oldest shop near Mochi gate, Lahore” all in an effort to locate “Yusuf uncle.” She manages to trace uncle Yusuf to his grandson’s sweet shop. His grandson arranges a visa for him, and the two grandchildren work together to fly Yusuf to India so that the two childhood friends, Indian and Pakistani, are shown meeting each other in a tearful reunion. A soothing soundtrack about a return to carefree childhood days provides a backdrop to this beautiful and problematic three and a half minute long video. The Indian subcontinent’s freedom from British colonial rule in 1947 was accompanied by a simultaneous violent territorial division along religious lines into present-day Hindu majority India and predominantly Muslim Pakistan. The division is captured in a single, and singularly evocative, word: Partition. This arbitrary territorial division was accompanied by death, displacement and destruction. Sheer numbers cannot begin to capture the loss underlying this catastrophic episode in South Asian memory. Yet, to provide some perspective, the Partition led to one of the largest migrations in world history with an estimated 12.5 million people being displaced or uprooted. Close to a million people were murdered or died from malnutrition and disease. People traveled in trains, in buses, in cars, but mostly by foot to move beyond newly created borders. Again, exact numbers are elusive and impossible, but it is estimated that roughly 75,000 women were raped and abducted by men of religions different from their own. Narratives of Partition are hard to recount even today, 67 years later. This difficulty comes not only from the unreliability and fickleness of memory; but also from the pain, complexity, and enduring effects of loss itself. 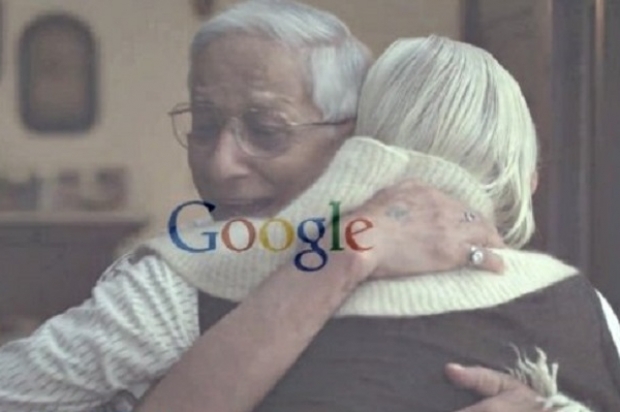 The advertisement in question sells Google’s unsurpassed ability to draw bridges between people and borders. Google’s search engine is certainly path breaking in its ability to help overcome many kinds of losses ranging from people to places to material objects. While Google can be a good solution when some things go missing, can it also repair torn connections and easily fill traumatic void? The popularity of this advertisement using the Partition as a theme and its emotionally charged reception by audiences can make us forget that by foregrounding its brand, Google is selling and commercializing feelings emanating from deep, traumatic loss. While Google can be a good solution when some things go missing, can it also repair torn connections and easily fill traumatic void? In my academic research, I focus on the digital possibilities and constraints for collectives – which I define as an engaged and committed group of people – currently working through trauma by reconstructing and reinterpreting past events publicly. I’ve been analyzing websites, blogs, listservs, and social media sites, as well as conducting interviews with people invested in acts of “active remembering,” or the process of conscious and deliberate recollection and recall. I have found that the present digital cultural moment is indeed powerfully shifting existing narratives of loss and trauma. However, working through this difficult process requires the full agency of its participants as well as a great deal of time. That is to say, the story Google tells with its quick, happy, and concrete answers is deceiving; most narratives remain much more partial and broken. The 1947 Partition of the Indian subcontinent continues to have echoes in present-day India. In majoritarian politics one sees memories of Partition used to establish the majority’s cultural superiority. In order to gain power the latter not only divests minorities of their rights, but also portrays them as perpetual “outsiders” in ways that fuel both majority and minority anxieties. Hindus are the majority religious group in India. Various forms of political ideologies emphasize Hindus’ legitimate claim over the Indian nation-state’s territory by alienating and dispossessing minorities. This kind of majoritarian manipulation relegates non-Hindus to a residual category within the Indian nation-state. Advocates and practitioners of majoritarianism use the Partition as a tool to make a case that religious minorities, specifically Muslims, ought to have been excluded from the “sacred Hindu” territory during the division of the subcontinent. Right wing Hindu nationalists manufacture animosity against Muslims through various techniques centering on real and invented differences in cultural practices. The Hindu nationalist party, the Bharatiya Janata Party (BJP ) formed a new government in India just last month under the prime ministership of Narendra Modi who was implicated in the 2002 anti-Muslim pogrom in Gujarat. This extreme end of the Hindu right wing has been especially instrumental in evoking memories of the Partition to draw boundaries with the Muslim “other” and unleashing massacres against Muslims. The xenophobic agenda to purge the “Hindu” nation of the ethnic “outsider” and their supporters is renewed by evoking sectarian sentiments that gripped the subcontinent in 1947 in the wake of creating of two separate nation-states. But as sociologist Dipankar Gupta points out in an essay on majoritarianism and minority politics (Citizens versus People: The Politics of Majoritarianism and Marginalization in Democratic India) right wing Hindu nationalists are not the only ones using the Partition as a lucrative memory for fabricating antagonism between religious communities. A similarly contrived notion of the “other” excluded vis-à-vis the inclusive “Hindu we” was also constructed in the 1980s. At that time, another religious community, the Sikhs, who had previously enjoyed a relatively comfortable relationship with Hindus and the Indian state, were suddenly targeted as a “threatening and disruptive” minority. This marginalization was deliberately designed to subjugate and repress a call by some Sikh leaders for greater regional autonomy within the larger Indian national space. A small group of Sikhs did in fact harbor secessionist agendas. Yet, rather than recognize the context and complexity of secessionist sentiments, they were used as an alibi for targeting an entire community and cultivating fear of another Partition. At the time the federal state was led by the Congress (I) party that had come to represent mostly inclusive, secular politics since the anti-colonial national struggle to free India from British colonial rule. In a bid to gain electoral gains, the Congress (I) used the secessionist movement to create the spectral threat of a second Partition. They pitted Hindus against Sikhs and targeted the Sikh community especially in the early 1980s, leading ultimately to a systematic and planned attack on the community in 1984 that left a gaping hole in the community’s identity and created an unambiguous minority consciousness. Given the political history of Partition as it stretches from 1947 through today, Google’s ad can be seen as a problematic sanitization and erasure. The ways in which the ad accepts separation as though it were clear and clean, its evincing of binaries and loss, must be evaluated against this complex backdrop more judiciously than is being done at present. Every year, Independence Day celebrations in India and Pakistan commemorate the end of British colonial rule, and intentionally leaves no public space for thought about the loss and trauma that accompanied that bloody exodus. Lives interrupted and broken by the Partition are neglected in pages of history textbooks, and, with the exception of scholarly and emerging fiction and art forms, 1947 is remembered only as a triumph over the 200-year long British colonial rule. Under these circumstances, any attempts at excavating Partition narratives have become highly welcome. The Google advertisement has evoked much emotion in the subcontinent as reported by various sources including the Pakistani newspaper The Dawn and National Public Radio. The advertisement went viral and had more than 11 million views at the time of writing. The only criticism voiced so far has come from people who object to the inaccurate portrayal of the visa process. It is true that travel between India and Pakistan is not easy, a visa is not guaranteed and permission to visit involves a convoluted and protracted process of obtaining necessary documentation. That said, I don’t think that this error should distract us from bigger problems in what the commercial does and does not tell its audience. Overall, I agree with the majority of viewers that this ad is moving and provocative. I would even go further and say that the Google advertisement could potentially be a platform to resist state elisions of Partition memories. Instead, Google is only using the Partition as a theme, emptied of its complexities, to sell its brand and instrumentalize and commodify sensitive memories in the process. Google Search helps you find whatever you’re looking for. We’ve brought this idea to life in a short video showing how human passion and hope can overcome time and borders. In this story, a woman in India reunites her grandfather with his childhood friend (who is now in Pakistan) following six decades of separation since the partition of India—with a little help from Google. We hope this is a reflection of the many stories of reunion. If you find it moving, share it—and tell us your own story in the comments. This is not the only instance where Google has commodified feelings to sell its brand. Interestingly, Google has itself admitted to using affect to sell products. In this article, Lorraine Twohill, Google’s vice president for Global Advertising is quoted saying, “If we don’t make you cry, we fail.” For example, their advertisement for the Google Chrome browser “Dear Sophie”in which a father sends multimedia messages to his baby daughter is based on a concerted shift in company strategy to sell by commodifying sentiments. Rather than considering Google as synonymous with digital media’s transformational potential, it must be situated in the larger socio-cultural digitized environment. Digital technology has ushered in new and unparalleled ways of grappling with trauma, ruptured speech and unfinished experiences. The simultaneous public and private nature of these platforms is proving critical in communicating sensitive, silenced and taboo subjects. It is public because it is collective, shared, and openly accessible. It is also private, however, because people are sharing their unique and idiosyncratic experiences. Private narratives are converging to create public stories digitally and safe and socially approved spaces for individuals to speak out are emerging online. This unique quality of digital media is proving constructive for writing and talking about difficult themes of loss and grief. These are not necessarily narratives that are finite and finished. Instead they are continuous ways of managing unmanageable residue that trauma leaves in its wake. While the Indian and Pakistani states engender official amnesia around the traumatic origins of their respective nation-states in celebrating independence from British colonial rule, digital technology is making it possible for people to begin to form a language around loss and create an archive of their ongoing experiences and emotions. There are several websites and blogs, run and managed mostly by children and grandchildren of those affected by the Partition, to collect narratives of so far silenced loss and trauma. Websites like www.1947partitionarchive.org and www.1984livinghistory.org are South Asian examples of attempts at making sense of the trauma of Partition and subsequent related events using digital media. Google’s advertisement fits well within this digital cultural moment. However, by placing itself at the center of loss and asserting that “Google search helps you find whatever you’re looking for,” the company is taking away the agency that people already possess in building their digital narratives. They are claiming attention for themselves and their handy strategy of loss-search-recovery and deflecting it away from these smaller, more organic efforts. My discomfort with this advertisement and its enthusiastic reception is the way in which the very ideas of loss, trauma and healing are being commodified and sold as rapid, split second recoveries, facilitated by a third-party such as Google. Recovery and repair are slow, simmering and gradual processes of piecing together broken fragments of memory that people must undertake on their own and in their own time, instead of “with a little help from Google.” This deceptive language masks Google’s commercial and self-elevating narrative. Nations and collectives grapple with trauma just like individuals. Trauma by its very definition entails a time delay between an experience and its integration and the latter continues to be broken, fragmented and has life after life. It is an extremely slow and painful, often impossible recovery to normalcy for collectives as it is for individuals. Google, in its true corporate and American emphasis on rapid recovery, healing and closure depicts a happy solution for loss by placing the spotlight on its highly accomplished and seemingly infallible search brand (the commercialization of trauma in the United States is very well explained in cultural critic Marita Sturken’s book, “The Tourists of History). It’s selling itself by deploying a particularly South Asian predicament while using specific American consumerist strategies in the process. Given the importance of mediated images and messages and people’s rejoicing and celebration, it is worth pausing to dissect the source of euphoria over the advertisement more carefully. Google search is making a claim for suturing together broken bonds. Is it quite as easy as that? Why is it making that claim? Is Google overstepping itself in casting itself as a protagonist in this long history of loss and grief? Is Google painting all aspects of our social world- from a search of an obscure word, to a quick lookup of a recipe, to our deeply felt emotions- with the same Google colored brush? Foregrounding broken ties and relationships to sell a brand is treading dangerous ground. There are grounds that are more sacred and fragile than Google and its advertisers seem to realize. In selling Google they are trampling upon sacred emotions for purely instrumental reasons. There is a clear line between Googling details of lost published memoirs versus Googling lost and buried memories of trauma. But the sentimentalism that Google is evoking has made us forget this important distinction. We must be wary of this deliberate blurring that is also made invisible to us. Living in a Google saturated age, we as social actors need to become more discerning of the limits commercial interests place on our agency. Let not the amnesia of Partition be replaced by the amnesia of commodification. Shruti Devgan is a Ph.D. candidate in Rutgers University’s Department of Sociology studying the sociology of memory, trauma and Sikh diaspora. She holds a B.A. in Sociology from Lady Shriram College (Delhi University) and an M.A. and M.Phil. in Sociology from Jawaharlal Nehru University. Her dissertation focuses on the interaction between digital media, diasporic location and intergenerational engagement in re-presenting memories of 1984 anti-Sikh violence in India.